If you thought the approval rating of Congress couldn't get any worse, think again. Rasmussen is out with new numbers and they're really ugly. Only six percent (6%) of Likely U.S. Voters give Congress good or excellent marks for the job it is doing, according to a new Rasmussen Reports national telephone survey. Sixty-four percent (64%) rate its performance as poor. 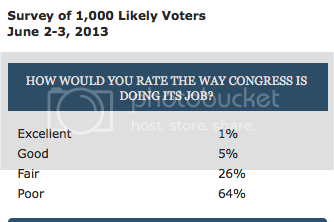 So, how do members of Congress keep getting re-elected if pretty much everyone disapproves of the job they are doing? Gallup found that 46 percent of respondents said they approved of “the way the representative from your congressional district is handling his or her job” while 41 percent disapproved. That’s in spite of the fact that overall Congressional approval was at just 16 percent in the same survey and hasn’t been higher than 24 percent since the start of 2011.